So, finally after a lots of speculation, ho-hum and "polling", the Yamaha YZF R15 hits the Indian roads and goes on sale. 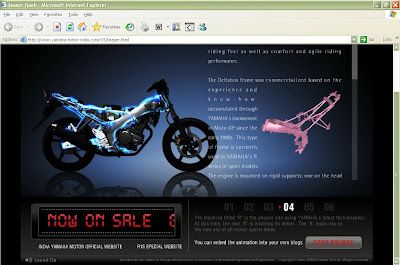 The Yamaha R15 official web site very promptly and proudly announces the same, and why shouldn't it be!! Got a chance to have a chat with the Local Yamaha Dealer here in Gurgaon, Badlia Yamaha and came to know that since the bike is being launched in Goa first, the final price is not out yet and would only be in a couple of days. Also, the Yamaha is planning to bring in two variants of the bike with a price difference of arround Rs.20k - Rs.25k approx. No doubt it's the fastest 150 babe arround and technologically way more advanced than the ZMA and the P220 and in a drag race might give both the big daddies a couple of anxious moments, but then .................... it's India, and the bike has to behave like an Indian to get accepted by Indians ................ we all know what happened with the first lot of the CBZs, the Pulsars and even the Hero Puch, they were all just leave the clutch and bang the pole machines which had be tamed to get accepted by the masses. So, let's go ahead and twist our wrist on this new baby!!! Congratulations to all for having the fastest 150 on road!! !